Elk, without sound and with sheer grace, harmoniously move through their home range and forests like wisps of smoke. Their lives have been intertwined with the outdoorsmans' spirit since the birth of hunting and they have provided beauty and sustenance for thousands of years, and for just as many to enjoy. Elk hunting means the dawn of a new season, a spiritual rebuilding for those who vigorously chase them, and only those with faith and the physical and mental fortitude to see it through, will tag and bag a trophy elk. 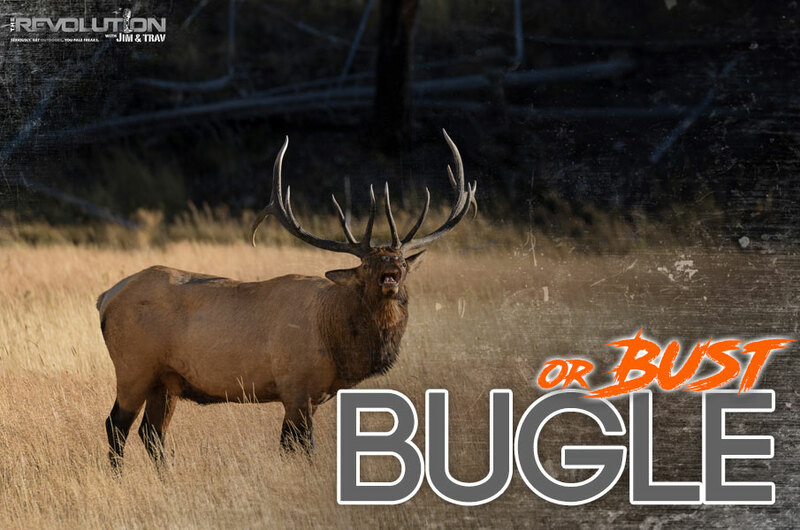 So this week on The Revolution with Jim and Trav presented by Outdoor Channel, Sportsman Channel and World Fishing Network, it's ‘Bugle or Bust’ as we take off in hot pursuit for wapiti (elk). Joining our elk hunting panel of pros will be Steve West of Steve's Outdoor Adventures and The Adventure Series, plus Nate Hosie of HeadHunters TV and the President and CEO of Hi Mountain Seasonings, Hans Hummel. Don't miss out on this week’s broadcast of The Revolution for your chance to learn what it truly takes to be successful tracking down one of America's most unforgiving wild game animals. Hunting isn't about the kill. It's about camaraderie, the memories that are made, the stories and bonds that are forged and the connection to conservation that's built upon it. For die-hard outdoorsman Steve West of Steve's Outdoor Adventures Saturdays at 10:00 p.m. ET on Outdoor Channel, plus The Adventure Series, hunting is his lifeblood, his personal divider that distinguishes living from merely existing. Steve will phone in to hand out his commonsense elk hunting game plan that works like a charm. Steve stresses that realistic expectations should be set long before a hunter ever leaves for his or her elk hunt. He believes most people don't have any idea how big a three-hundred-inch elk is, because all the magazines want to talk about are three-hundred-fifty plus inch bulls. Steve goes on to say that you need to do your research for the area you are hunting, and find out what is a good, mature, representative (elk) for the area that you're going to be hunting in. He’ll then direct his attention to elk calling. Elk are very social animals and that makes many hunters think they need to get out there and bugle back at them, however Steve disagrees. He’ll explain why, more often than not, bulls can spot a phony call and how calling will move bulls away from you rather than drawing them in. Instead he encourages hunters to listen for the elk and then go to them instead of trying to make them come to you. Get fantastic tips from the pro himself, tune in to hear more elk hunting advice from Steve West. This week Hans Hummel the President and CEO of Hi Mountain Seasonings joins Jim and Trav to talk about the endless options they have when it comes to seasoning and transforming your wild game meats into meal time show stoppers. A mature elk means hundreds of pounds of fresh venison and Hans says a great way to use some of this meat is to make it into sausage. Hi Mountain Seasonings has several different, all-inclusive, sausage making kits that take away the guess work. Choose from bratwurst, salami, summer sausage and more in a variety of different flavors and all you need is a grinder, your meat and the kit of your choice and you are ready to go. Hans says it’s important to follow the instructions provided, so that your sausage turns out delicious and not over, or under, seasoned. With 25 years of experience, Hi Mountain Seasonings has this down to a science and can help you put out a quality batch every time. In addition to regular sausage, Hans says they have a variety of breakfast sausage kits as well as a line of excellent rubs to elevate the flavor of your next elk steak. Tune in to find out about all the great items Hi Mountain Seasonings has to make your game meat taste better than it ever has before. For many, elk hunting, is the pinnacle of big game hunting. The thought of chasing big bulls and ultimately bringing one home is a hunter’s fantasy. However, in the middle of those day dreams, rarely are we thinking about the challenges one must face in order to prevail. Nate Hosie, of HeadHunters TV Thursdays at 8:00 p.m. ET on Outdoor Channel, joins Jim and Trav this week and discusses his most difficult hunt to date, his first elk hunt in Colorado. When elk hunting, you need to be physically prepared and capable of hiking miles every day and dealing with inclement weather and higher altitudes. Nate says, “You train all summer long, but the mental game is something you can only really learn once you actually go out and do it.” Nate talks about the challenges of this particular hunt, from limited encounters with elk in the beginning, to contending with herds of wild sheep pushing the elk up higher. Staying positive, even when the prospects of actually harvesting an elk seemed slim, was a mental hurdle he had to overcome. When the odds finally turned in his favor and Nate was able to arrow a mature bull, he encountered the next big challenge of elk hunting – packing out the meat. Nate talks about the importance of being properly prepared before you head out to hunt elk and how he dealt with the challenges he faced. Nate will then switch gears and talk about his guest appearance on NRA All Access Presented by Franchi Wednesday September 14th and 21st 7:00 p.m. ET as well as his music career and an upcoming EP he is working on now. Be sure to tune in!